Pattison Liquid Systems Inc. is a leading manufacturer of liquid fertilizer application & handling equipment. Located in Lemberg, Saskatchewan. In our latest blog, Brad Hodel from Pattison Liquid Systems explains how to troubleshoot new models of Banjo Electric Ball Valves. These valves are found on all new models of Pattions Liquid Wagons. 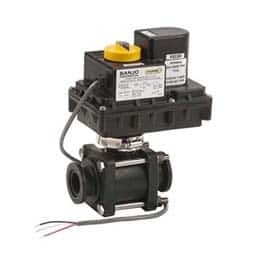 Manufactured and assembled by Banjo Standard Electric and 3-Way Banjo Electric Ball Valves are used in various Agricultural and Industrial liquid applications. Our Electric Valves are of the highest quality and available in glass-injected polypropylene and stainless steel materials. The operating pressure ranges from 100 – 150 P.S.I. depending on style. Standard Electric Valves are used in various Agriculture and Industrial liquid flow applications. Standard Electric Valves are available in glass injected polypropylene materials, and range from ¾” to 4” in size. See the product page here and contact us to order or with any questions.